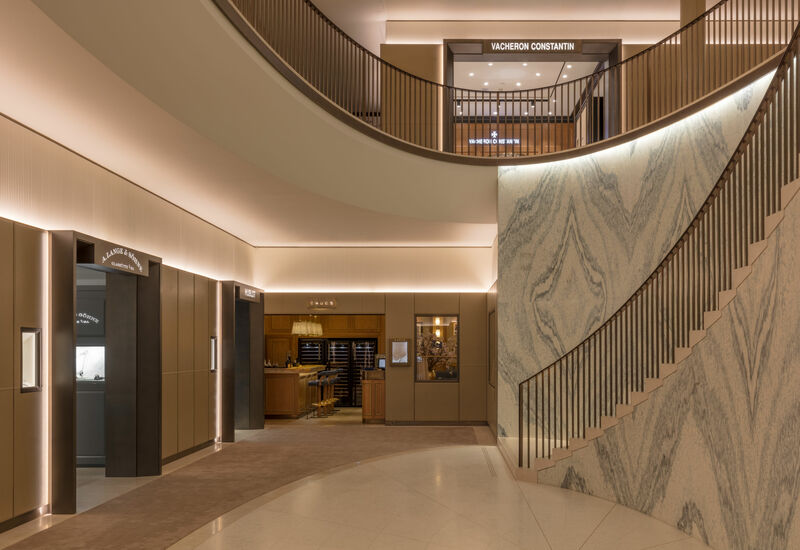 Designed by Rundell Associates, the new Fine Watches department at luxury store Harrods is an exclusive horology destination spread over two floors. 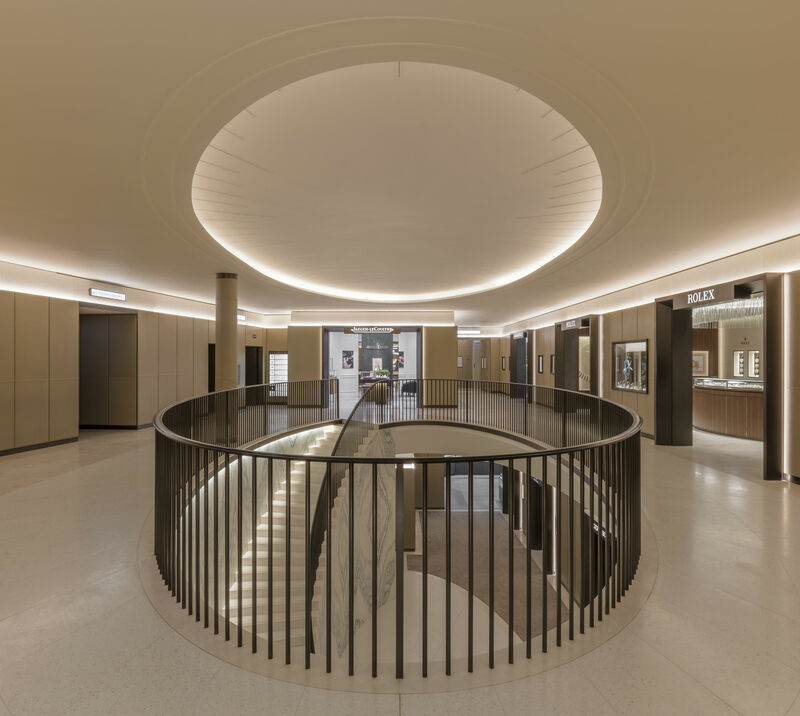 Design and architecture practice Rundell Associates has unveiled their redesign of Harrods' Fine Watches department, producing a comprehensive redevelopment and expansion of the space. Using their design and architecture knowledge and skills, Rundell Associates have designed a unique, in-vogue destination within the luxury store at the heart of Knightsbridge, London. The main inspiration behind the design was to create a retail environment of the highest quality, which portrays the art of watchmaking. The new department is set across two floors, adjoining Harrods' Fine Jewellery room. The luxurious, fresh space is complemented by slender bronze detailing throughout and includes a sweeping marble staircase directly beneath the vaulted ceiling, leather-lined walls, and custom designed terrazzo flooring. The face of the central staircase has been crafted from single block of Cipollino Tirrenia - one of the world’s rarest and most dramatically constructed marbles. Complex veining with a striking graphic appeal draws the eye along the stairs’ carefully orchestrated route, from the department’s ground floor to the lower ground floor. The ground floor, lower ground floor and staircase are laid with Italian Terrazzo flooring, created specially for the project by an Italian specialist; iridescent mother of pearl fragments have been used to brighten the pale cream background. The floors are also embedded with bronze inlay strips to mimic the detailing used on a watch face, and on the lower ground floor, a patterned inlay frames the famous ‘H’ of the Harrods logo. A domed lighting feature has been shaped into the rounded ceiling above the glorious staircase; its elliptical shape echoes the old essence of the light wells that were once a big feature of Harrods' design. Specialised lighting has been provided for wall cabinets and general displays, while cove lighting is featured in all of the main areas - customers will marvel at the visual impact of the watches on display. 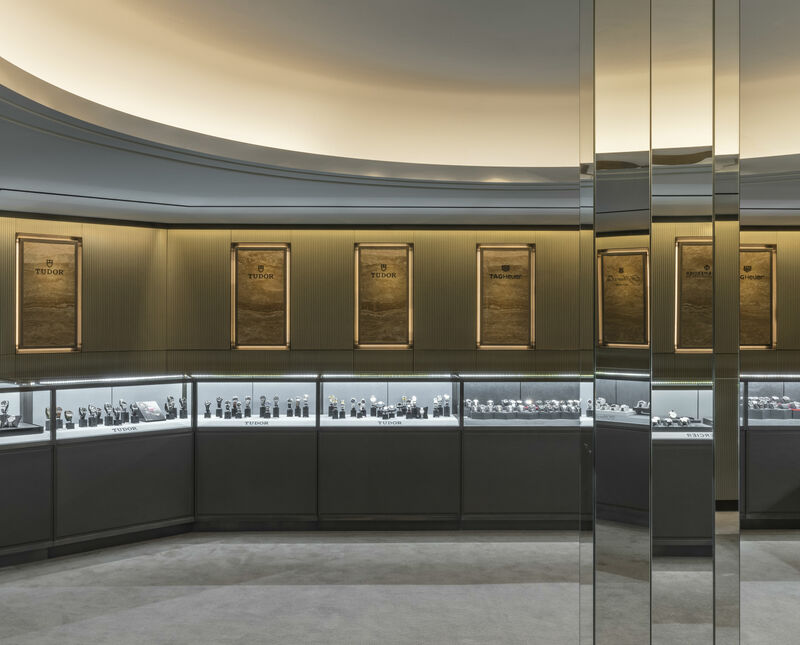 The new Fine Watches department showcases brands including Audemars Piguet, Jaeger-LeCoultre, and Rolex and Vacheron Constantin; it also stands out because of its ten large boutiques, a multi-brand area and VIP suites across both floors. An aftercare department has been fitted on the lower ground floor of the department, reinforcing Harrod’s focus on customer care; this provides a space for horological expertise, supplemented by the introduction of watchmakers – a first for Harrods.